ESIC IMO Admit Card 2018: Employee State Insurance Corporation Ltd. (ESIC), Delhi is ahead to conduct the Insurance Medical Officer Grade – II (Allopathic) examination shortly. To attend this test, the applicants must get ready with good preparation as the competition is high for the announced posts. Though the ESIC announced 771 IMO Grade II posts, the competitors are more than 1 lakh for the announced posts. Hence the competitors have to give their best in the examination to get the good score. Before going to the examination, candidates must download ESIC IMO Grade II Hall tickets from the official website, esic.nic.in. The hall ticket/admit card is an essential document to attend the examination. Hence all the aspirants have to download and carry the admit cards without fail. The examination officers will not allow the candidates to attend the test without admit cards. Employee State Insurance Corporation Ltd. (ESIC), Delhi is the central government organization. Many of the hopefuls dream to get the job in ESIC every year. The organization recently issued the notification for 771 Insurance Medical Officer Grade – II (Allopathic) posts. Many of the aspirants desirous to get ESIC IMO jobs have applied for the announced posts during the application dates. Candidates will be shortlisted through the written test and interview rounds. The merit candidates will be finally selected for the IMO Grade II posts. 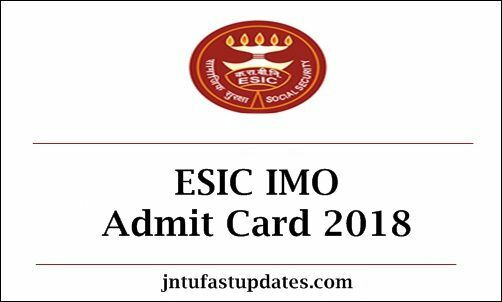 All the applicants must download ESIC IMO Grade II Admit Card/Hall Ticket 2018 from the official website, esic.nic.in. The hall ticket is expected to release 10 days before the examination date. All the hopefuls must download and preserve the hall tickets to carry to the examination. After downloading the hall tickets, candidates can check the details of their examination venue, date, and timings from it. The hall ticket is supposed to give the information of candidates such as the candidate’s name, register number, hall ticket number, candidate’s photograph and signature, and other details. Verify all the details carefully once after downloading the hall tickets. Applicants who are going to compete for the ESIC Insurance Medical Officer examination as per the scheduled dates must carry the admit card hard copy without fail. Also, candidates must carry any of the valid identity proof copy such as Aadhar Card, Passport, PAN Card, Driving license and other valid identity proof copy along with the hall tickets. It is must to carry both the documents.